In pursuance of the second strategic goal, the UR engages to strengthen and develop the established partnership links with universities and business organisations participating in the Programme, trying to stimulate their efficiency and to avoid “latent” agreements. In parallel with this, the University will continue to conclude new agreements for student and staff mobility with participating countries and countries from the rest of the world. 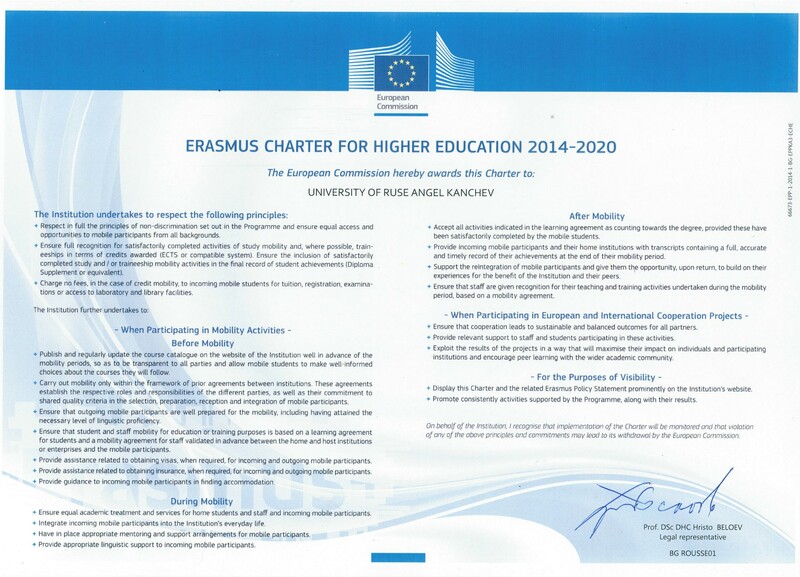 The main principles that the University commits to follow in mobility activities, are: offering a wide geographical range of mobility destinations; increasing mobility in all tree cycles of the higher education; increasing the placement mobilities; stimulating and increasing the staff mobility for teaching and training; ensuring equal possibilities for mobility especially for physically and socially disadvantaged people. Some new forms of mobility that the UR commits to develop in the period 2014-2020 are mobility designed for staff from enterprises and degree mobility. For the realisation of degree mobility the university will use its experience from the implementation of joint bachelor and master degree programmes with international partners. One exemplary initiative of this kind is the establishment of the Bulgarian-Romanian Inter-university Europe Centre (BRIE) in 2001 with the support of the German Rectors’ Conference. BRIE is the first Bulgarian and South-Eastern European cross-border educational structure in which successful education in master degree programmes in English language ending with mutually recognised diplomas has been carried out for more than 10 years. The third semester of these programmes is conducted in German universities making use of the Erasmus scheme.